i love the subtle soft blue color, we don't have it however. I love the pretty sky blue colour. Happy weekend everyone! 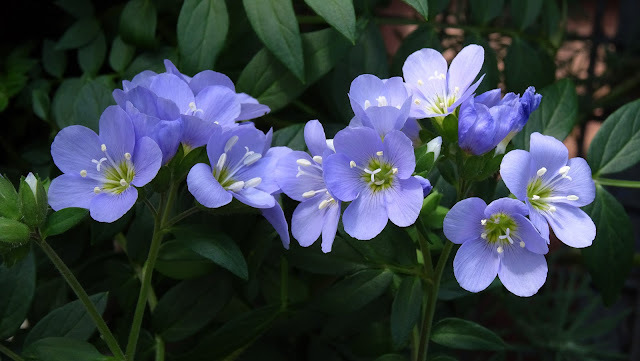 I painted a 36 x 36 inch oil painting titled Jacob's Ladder, and the only resemblance is that it's in a blue (an ultramarine) and white range:) These flowers are very pretty! A very pretty little flower that I remember seeing a great deal when I was young, but rarely see now - at least not in my peninsula world. these small blues brings a smile to my face - thanks!!! Great blog. You have some fantastic photos here and I appreciate the botanical info. Thanks. love these soft little flowers! A beautiful photo of a flower and plant that is hard to photograph well. Yours looks so very healthy and vigorous. Oh these flowers are so pretty!